WASHINGTON — The United States will strive to take in 110,000 refugees from around the world in the coming year, the White House said Wednesday, in what would be a nearly 30 percent increase from the 85,000 allowed in over the previous year. The increase reflects continuing concern about the refugee crisis stemming from Syria’s civil war and conflicts in Iraq and Afghanistan. Yet it’s still far short of what advocacy groups say is needed to address an unprecedented crisis that saw some 1 million people pour into Europe alone last year. Of the 110,000, 40,000 will come from the Middle East and South Asia, where the origins of the crisis have been most pronounced. An additional 35,000 will come from Africa, 12,000 from East Asia, 4,000 from Europe and 5,000 from Latin America and the Caribbean, White House spokesman Josh Earnest said. The administration did not release a country-specific breakdown. The total includes 14,000 unallocated slots that can be given to refugees from any region once Congress is notified. Secretary of State John Kerry had previously suggested that the U.S. target would climb to 100,000 in the coming year, but that the figure was a floor, not a ceiling. He briefed lawmakers on the revised figure on Tuesday. The 110,000 goal covers a 12-month period that starts next month. In the 12 months ending Sept. 30, the U.S. goal was 85,000, and in the three years before that, the target was 70,000 per year. The White House has tried to emphasize that the refugee program is safe and doesn’t pose a major threat to national security. That concern was heightened last year after terrorist attacks in European cities, including some connected to people who had spent time in Syria. Officials said that potential refugees would continue to be subject a rigorous screening process that typically lasts more than a year and involves both in-person interviews and examination of biographical and biometric information. The 110,000 goal covers a 12-month period that starts next month. 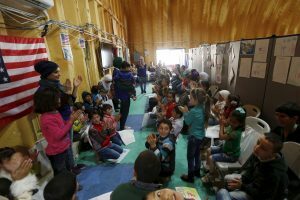 The announcement came two weeks after the U.S. announced it had met President Barack Obama’s goal of admitting 10,000 Syrian refugees despite early skepticism that it would reach its goal. Millions of Syrians have been displaced by a civil war that has killed roughly half a million people. Republican governors have pushed back vehemently and tried to refuse to let them into their states, leading to a clash with the administration, which has maintained that states can’t legally bar refugees who otherwise meet the criteria. The U.S. has tried to encourage other countries, too, to increase their contribution to alleviating the refugee crisis. The official said increasing the U.S. target this year reflected that strategy and Obama’s belief that all nations need to do more to help the neediest. As part of that effort, Obama plans to host a summit on refugee issues with world leaders next week during the U.N. General Assembly gathering in New York. The White House said the summit would spotlight the need to increase money for aid agencies, resettle more refugees and provide education and job assistance. The refugee crisis has become a major political issue in Europe, where countries have been inundated by migrants after harrowing journeys that have killed scores. Concerns about refugees have played into the broader debate about immigration in Europe and were a major factor in Britain’s recent vote to leave the European Union. Associated Press writers Jamey Keaten in Geneva and Kevin Freking in Washington contributed to this report.